Citation Information: J Clin Invest. 2017;127(9):3402-3406. https://doi.org/10.1172/JCI93362. 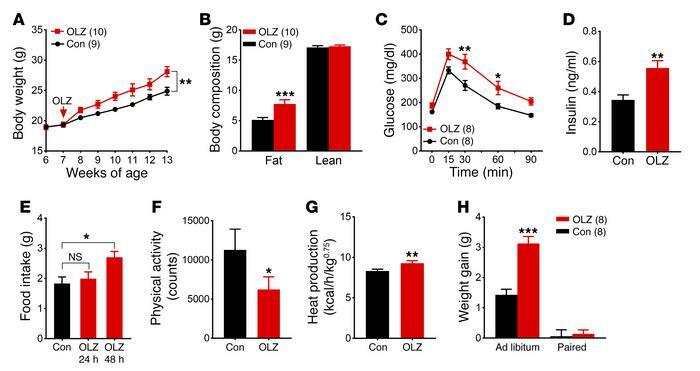 Olanzapine treatment profoundly alters energy homeostasis in female C57BL/6 mice. (A) Body weight. (B) Body composition. (C) GTT. (D) Plasma insulin levels. (E–G) Metabolic cage analysis (n = 6) of food intake (E), physical activity (F), and heat production (G). (H) Weight gain in ad libitum– and pair-fed mice. Results are shown as mean ± SEM. *P < 0.05; **P < 0.01; ***P < 0.001 versus other genotypes assessed using either Student’s t test or 2-way ANOVA with Sidak’s multiple comparisons test. OLZ, olanzapine treated; Con, control.